This is a lightened and less-sweet take on the classic black cod with miso. Black cod is a luxurious fish—in terms of price and texture. Chef Nobu Matsuhisa showed the world how well it pairs with miso with his iconic and often imitated dish. I teamed the two ingredients here, but instead of creating a sweet glaze the way Matsuhisa does, I take a more subtle approach and poach the fish in a savory broth. Germany is better known for its white wines but the country's reds are increasingly making their way to the US. Usually light-bodied, minerally and aromatic, Germany's Pinot Noirs are a great match for richer fish dishes like this one. 1. In a deep skillet, heat the oil until almost smoking. Add the light parts of the scallions, the ginger, carrots and a pinch of salt and stir-fry over high heat for 30 seconds, until fragrant. Add the chicken stock and a pinch of sugar and bring to a boil. 2. Lightly season the fish with salt and nestle the fillets into the broth. Reduce the heat to moderately low so the broth is just barely simmering. Cover the skillet and poach the fish until it's opaque throughout, about 5 minutes. 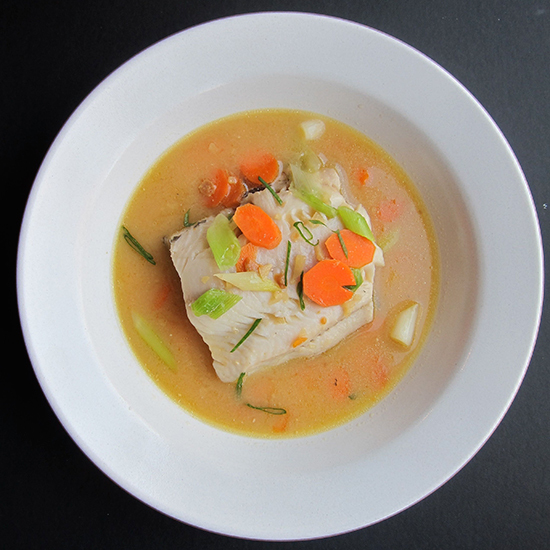 If the fillets are not fully submerged, occasionally spoon some of the hot broth on top of the fish. 3. Transfer the fillets to shallow bowls. Ladle out about 1/2 cup of broth into a small bowl and whisk in the miso. Add the miso broth and the lemon juice to the skillet and allow to warm through. Ladle the broth over and alongside the fish, garnish with scallion greens and serve. One serving 405 cal; 15.2 gm fat, 2.3 gm sat fat, 16 gm carb, 4 gm fiber, 50 gm protein. Wine Light, aromatic Pinot Noir, like 2011 Weinhaus Heger.